I worked on the many many tiny bits of green scraps. I had tons of little triangles left from making binding. 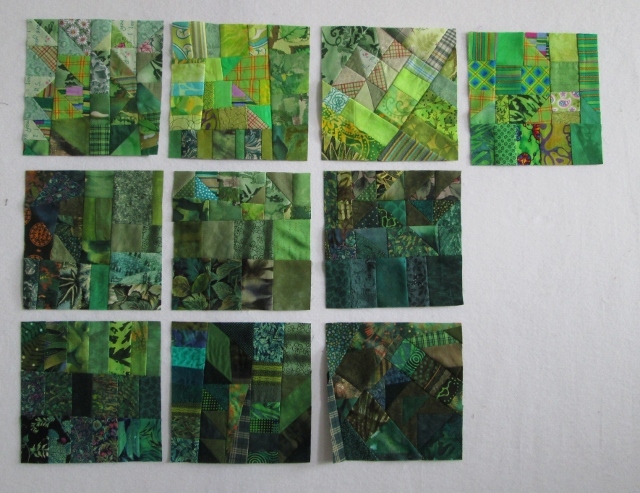 I love to use green for my binding. I got 10 crumb 6" blocks done. I also like to call this Poverty Piecing, as I am making something out of nothing. I love the depth of the greens in these blocks. 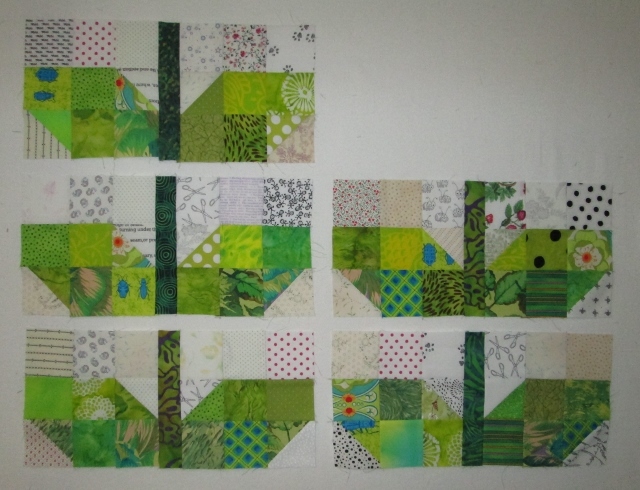 I got five Lime green sprout blocks done. I still have enough that I may get 5 more darker green blocks done this next week. You can find the pattern at Tracey Jay Quilts. I found the clover block on Pinterest but then I did not like the web site instructions, so I kind of made up my own. They look the same. Can you see the background fabric? It is horse Shoes. How very lucky is that? This is Selvages. Yes I have gone crazy and mad and silly all at once. 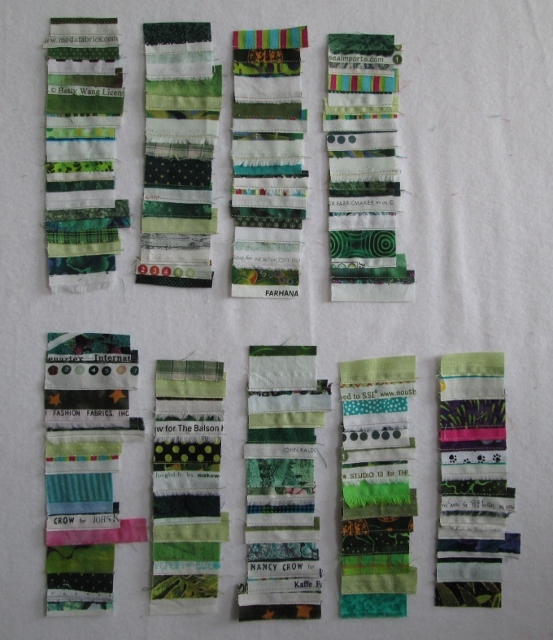 I sewed the green (and other colours here and there) bits of 2" wide selvages I had collected. I have no idea what I will do with them now. I need to sew more before I can make much. I will be adding this post to the linky party over at Soscrappy. Go see what other are doing with their green scraps. So I am out the door today. The Leduc Black Gold Quilt Patch is having a Quit till you Wilt day. We have rented a church for the day and are sewing up a storm. We have another crappy weather weekend with snow/rain/sleet. There are no agility dog trials locally. So I sew today. We also have pot luck supper planned. It should be a good time. 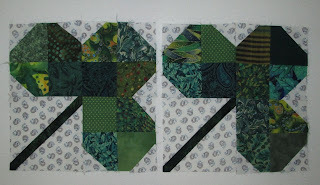 I love the texture in those scrappy green blocks!! Of course I love your green sprouts (I am so making those next year) and I love the watercolor effect in your green Poverty Piecing. ha! So pretty. You have been busy, Cathy! Love your crumb blocks. I need to make a couple this week.Love the sprouts and double lucky clover blocks, too. I love pot luck... others are such good cooks. 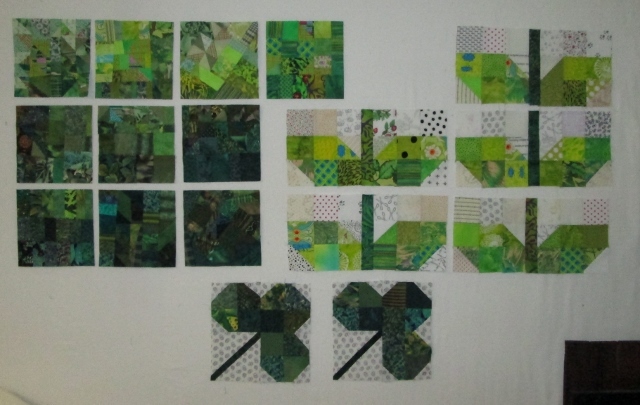 Your poverty blocks are gorgeous, and look vaguely like a watercolor quilt. Thanks for sharing your blocks. Love it all! Cathy, you have so much to show in green, I really like how your crumb blocks turned out, the variation in colour is rich. Wow - you have been very busy. Your sprouts and clover look terrific and your crumb blocks make me think of a jungle. OH my goodness...so many gorgeous green blocks!! You have some really great green blocks! Off to a quilt till you wilt gathering? I would think you would already be wilted after all you have accomplished! Very pretty greens!!! Did you wilt? Love all the gradations of green in your poverty blocks. Such cute shamrocks.... Those would make a great little table runner for the holiday. I love all the green! Hi, Cathy. Your green blocks are so pleasing with all the gradations--exquisite!